On one hand, you have Ford vs Chevy, on the other, you have Stihl vs Husqvarna. While I love cars and could debate the Ford/Chevy scenario for hours, at the same time, I also have a knack for chainsaws and would love to give you some insight on Stihl vs Husqvarna chainsaws. If you were to go out into the logging industry and choose ten random loggers to talk to and ask which one they prefer, whether they prefer Stihl or Husqvarna, you would more than likely find a 50/50 split between the two. So, today, I am here to discuss the pros and cons of both the Stihl and the Husqvarna chainsaw so that you will be able to choose the one that you feel is the most suitable for you. Stihl is a German company, while Husqvarna is a Swedish company – both of the companies have started to put more Chinese parts into their saws, like bars and carburetors, which is normal in today’s world as this is what helps companies be able to offer lower prices. However, the fact that there are Chinese parts in both of the brands chainsaws doesn’t put a damper on the quality – both still offer quality products and they have both been making chainsaws for decades. Very reliable and affordable. Great for residential use. Affordable price and good performance. Strong, no leakage, and easy to assemble. Easily adjustable and lightweighted for easy use. Low emissions, increase power, and reduced fuel consumption. Starting out, you’ll discover that while these two companies are similar, they cater to two different markets – professionals and homeowners. If you’re familiar with the chainsaw market, you probably already know that professional chainsaws are obviously more expensive than homeowner saws. Homeowner saws have shorter bars, smaller displacement engines and plastic crank cases that make them lighter. The professional saws that are for loggers, lawn care workers, forestry and other professionals are a bit more heavier and do not have plastic crank cases. Homeowner saws are usually under 55cc and have bars that are either 18” or 20”. The professional chainsaws usually range go anywhere from 55cc to over 100cc, so they obviously have more power so that they can run longer bars for cutting larger trees. They have either magnesium or aluminum crank cases, making for greater durability. Professional saws usually have other features like rip sprockets instead of spur sprockets, which make them so that you can use them full-time. You may not realize it right now, but the fuel tank is a major concern when it comes to chainsaws. If you plan on using the chainsaw for a long period of time, you don’t want to continuously stop to add fuel. Husqvarna chainsaws usually have a bigger fuel tank, which means less interruptions during your work. However, just remember that when you have more space for the tank and you have more fuel in the saw, it will add some weight. So there is a pro and a con to having a bigger fuel tank on the chainsaw. You have probably heard someone saying how they have used a Husqvarna chainsaw for decades and this gives us the impression that they are long-lasting saws. However, this doesn’t mean that you should turn around from Stihl, as they too have paid attention to durability and have a powerful engine. Yet, in terms of lasting for decades, Stihl needs to develop a reputation because Husqvarna has a long history that dates all the way back to the 1600’s. In this category, Stihl wins as the price of a Stihl chainsaw is lower than the Husqvarna. With the function and power being similar, the Stihl makes for a great alternative when looking for a gasoline-powered chainsaw. Yes, there are brands out there that offer lower prices than Stihl, but you have to consider the quality along with the price – this is what makes Stihl one of the biggest competitors of the Husqvarna. The power varies based on the product, and the engine is obviously a factor. This makes it hard to compare the power as a characteristic, regardless of the product. However, based on what the majority of the users prefer, we can say this …the Husqvarna is better for the professional because it is capable of offering a strong cut with it sharp blade. The Stihl is great for the home user – the cut is strong enough and the strength is suitable enough to be able to even out branches on a tree. The Stihl doesn’t require as much maintenance as its opponent. It doesn’t require a whole lot of knowledge of the motor or the machine itself, which in my opinion, makes it a great chainsaw for a novice. Stihl and Husqvarna are known for producing chainsaws in two basic types – you have electric and petrol. The type you choose will all depend on the tasks at hand. Electric chainsaws tend to cost and weigh less than petrol chainsaws. This is due to the fact that instead of carrying their fuel, they have a power cord. I have also noticed that electric chainsaws are easier to start up than the petrol versions – all you have to do is pull the trigger and it’ll start up. Electric chainsaws are also usually smaller, which, unfortunately, limits them to only light duties like cutting small trees. Also, because they are corded, you will only be able to use the chainsaw near an extension cord. Petrol chainsaws are more powerful and cut quickly and smoothly than electric saws. However, they are noisier and heavier and starting the engine may take a couple of pulls. If you have a petrol chainsaw, you will need to perform maintenance regularly in order to make it last for a long time. Petrol saws are great for cutting down big trees, so you’re not limited to only small trees. Plus, you don’t have to rely on an electric cord. Reduced Kickback Bar – This is a bar with a small tip that limits the cutting area that generates the most kickback. Reduced Kickback Chain – There’s an extra guard that links on the chain. This is responsible for keeping the cutting teeth from taking too big of a bite. Bar Tip Guard – This is a steel attachment that covers the nose of the bar. It prevents the tip of the chain from being caught. This feature also helps prevent kickback. Chain Break – This feature is responsible for stopping the chain almost instantly when the tool kicks back or when the front hand guard is pushed forward. Trigger Knockout – This prevents accidental engagement. The throttle trigger won’t work until the button is pressed. Automatic Chain Oiler – This allows you to operate the machine without having to stop and manually pump oil onto the cutting bar. Anti-Vibration – Most gas-powered models contain anti-vibration. Both Stihl and Husqvarna manufacture a wide away of bar and engine sizes. Stihl chainsaws, I have noticed, are geared more so towards lumber cutters. Husqvarna, on the other hand is tailored more so for homeowners and farmers. Chainsaws that are for lumber cutters have a tendency to be larger and heavier. The cutting quality of both the Stihl and the Husqvarna chainsaws are considered similar. Both of the brands have powerheads that have been designed to maximize the cutting efficiency. 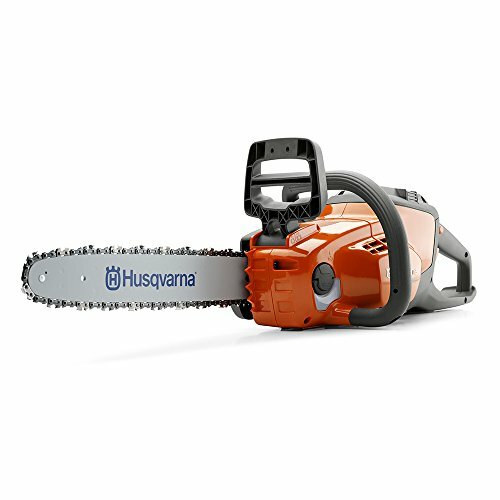 Husvarna chainsaws are lighter, which makes it easier to use them for a longer period of time. Some prefer Stihl saws because of the fact that they can be used for a longer period of time. 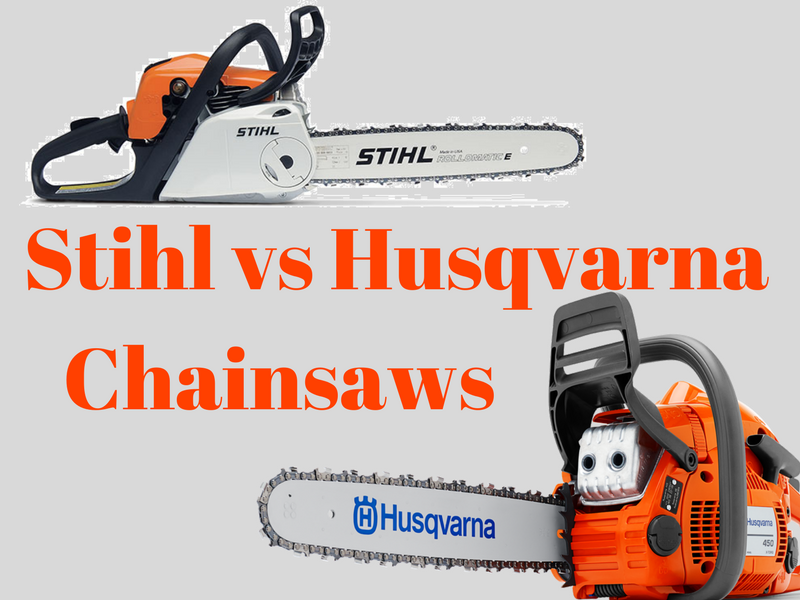 Both the Stihl and the Husqvarna chainsaws are durable, reliable and efficient – this is why Stihl vs Husqvarna has always been a popular debate. Each manufacturers tools offer their own drawbacks and benefits, so before you choose your tool you need to consider the task. You also need to think about the type of chainsaw you require – Petrol saws, as I mentioned, are more powerful, which makes them great for large-scale jobs. Electric chainsaws are great for light duty tasks. Whether you choose a Stihl or a Husqvarna chainsaw is fully up to you. However, it can be summed up like this – Husqvarna chainsaws are usually lighter, which makes them a popular choice for homeowners that only need a saw for small tasks. Stihl chainsaws are usually larger and have more power, so they are great for timber cutters and others who frequently need a chainsaw for large jobs.